We're back from Guatemala. Read The Culture of Fear by Barry Glassner on the plane. Still not sure if the "media" is to blame for our increasingly misguided culture. In my experience, endemic problems such as this stem from the management. Extremest media is easily sold to an oppressed populace (ie: christian-eating lions). The problem is, Americans shouldn't feel oppressed. We the freeest country in the world, right? Following a tactless comment, we lost our spanish-speaking travel partner at a mall, during our Houston layover. In Guatemala we went directly to Antigua from the plane, via reckless minivan. Wandered from the dropoff into a bar, where a stoic German directed us to a beautiful hotel that was open late. "Bang on the door loud, the guy's probably asleep". Courtyards, flowers, clean rooms and baths for US$5/person/night. Danced and drank 'till late. Tasty "typico" in central park morning, wander cobblestoned streets, entertained locals with hackeysack and harmonica, and rented a car. Panajachel by evening, more dancing and drinking at the local pubs. More than an ounce of marijuana for $12. Boated across lake Aititlan, framed by volcanoes, to visit San Pedro and Santiago and San Antonio Palopo. Played the harp and shared a Pepsi with a kid on a dusty road while Ben fed a cow. Coke and Pepsi are, apparently, more popular in "Guate" than in the US. The 3 chatty Australian guys and 2 chicks from Honduras got left behind. We worried about them for a bit, while boating back across the beautiful lake. Drove north to Sacapulas, typical dinner at a comedor. Two Manhattanites and an Indian guy were hanging out outside a hotel. We asked them where the hotel was. 2 Israelis walked up and asked the same thing. Cerveca Gallo, politics with the Israeli's. Immersion-coil tea. Accidentally drove to Nebaj in the morning. Impossibly dangerous and beautiful winding moutain roads. Bought Guate-mixed reggae tapes at the Nebaj market. Vacca-vacca-vacca, dancing all the way to Coban. Wooden Indiana-Jones-style bridges over lush river jungle mountainscapes that can "only" support 1 car at a time. Met a dusty, stoic German biker group that reluctantly gave terse directions when prompted. "Donde esta a Coban?" Well, "derecho" sounds damn similar to "derecha", so don't blame me. Splurged on a palatial US$25 hote and margaritas in Coban. Lanquin Caves, swimming in Semuc Champey, yet another large group of German bikers (really!). Cahabon by evening where beautiful Peace core girls made us a nice dinner, helped us find a hotel. Possibly from the swimming - a 12-hour bout of dysentary, fever. A marketplace sprang up around our car. Bribe the guy to move his cart? Nearly, but when we started playing Orangutan Soup on the dashboard (card games are an international sign of infinite patience), he gave up and moved for us. Onward on dangerous chicken-bus roads to El Astor, where we took a boat on the lake and saw howler monkeys and all sorts of big, beautiful and presumably rare birds. A bird in every branch of every tree for miles. Massibve blue herons. Some places, the sky was so thick with birds, it blocked the sunlight. Gave a ride to Harry from Austria back to Zacapa (overnight), and then to Guatemala city. 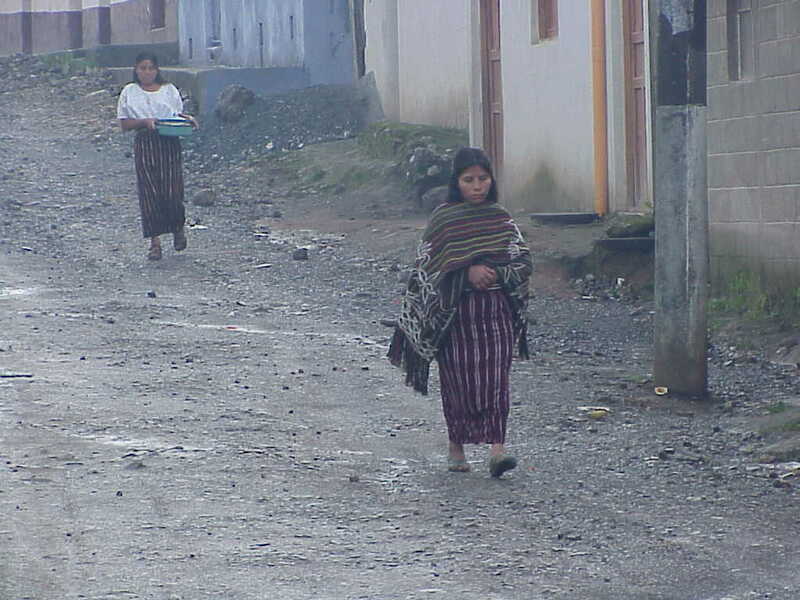 The people in Guatemala are generally happy, generous, confident and friendly. It's nothing at all like the U.S. Twice I saw a woman signing while putting out clothes on the line. It's like watching some cash-poor, Central American version of Donna Reed.